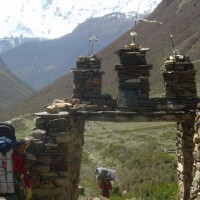 A fantastic Manaslu to Tilicho trek provide unique itinerary links the trek around Manaslu with a traverse of the northern Annapurna range to Jomsom and explore the "Great Barrier". 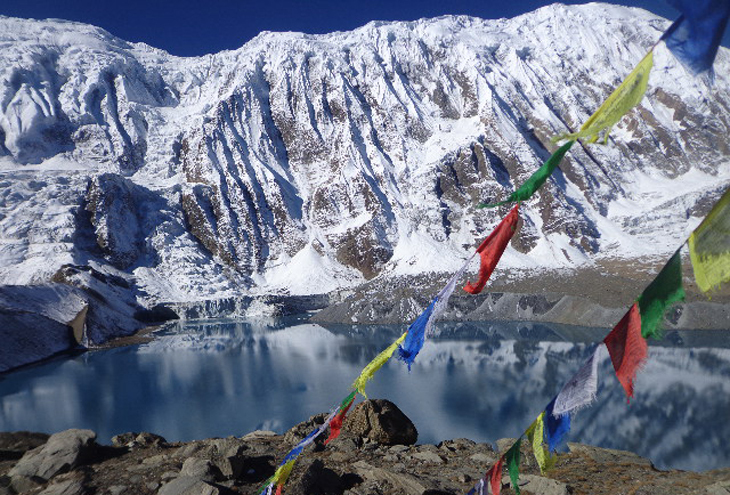 You ascend to the foot of the North Face of Manaslu and crossing two remote passes; the Larkya pass (5,135m/16,847ft), is one of Nepal's best-kept secrets and the Tilicho Lake & Meso Kanto La (5,300m/17,388ft). You are rewarded with a stunning panorama and finest aspects of spectacular massifs.Your Manaslu to Tilicho trek begin in the ancient town of Kathmandu; from where you will board a bus to Arughat and follows the meandering Buri Gandaki River northwards to the village of Deng. Although quite board initially, the valley soon narrows down and you soon find that you are clambering high above the river on fantastic paths which cling precariously to the hillsides. This part of Nepal sees only a handful of trekkers each year and you can expect the trails to be less crowded. As you progress further northwards the valley opens up to reveal delightful alpine meadows and small Tibetan villages that are found in a cluster beneath sweeping North Face of Manaslu. You continue through Jagat, Gap Pu and Sho, typical Tibetan villages with rows of the prayer wheels and Mani stones. The trail eventually reaches Samagaon, the largest and most important village of this region. This is a key staging post for expedition teams attempting to climb Manaslu and the mountain from here is outstanding. From the Samagaon you head west & cross the Larkya La (5,135m/16,847ft), a classic pass linking the Buri Gandaki with the Marsyangdi Valley, with farm lands forming a part of the old trading route between Manang and Tibet. From the top of this pass you are rewarded with a stunning panorama looking towards Himlung Himal (7,126m/23,379ft), Manaslu & the Annapurna peaks, with the peaks of Ganesh Himal (7,406m/24,298ft) rounding off the east. The descent passes through the alpine meadows of Bimtang to join the renowned Annapurna Circuit at Thonje. Tillman first surveyed this region in 1950 on his reconnaissance of Annapurna. After following the traditional Annapurna Circuit route for three days to Manang the trek continues to the remote Tilicho Lake & Meso Kanto La (5,300m/17,388ft) sometimes called the Tilicho pass, which provides a direct route to the Kali Gandaki valley. 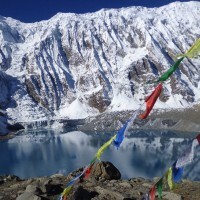 Tilicho Lake lies below the 'Great Barrier' and it was this huge wall of snow and ices that thwarted Herzog's initial approach to Annapurna in 1950. This fabled region has only just been opened up to trekking groups and yours will be one of the first groups to visit this area. Tremendous views of Dhaulagiri (8,167m/26,795ft) can be seen as the trail descends down to Jomsom, where an exciting mountain flight and transports you back to Kathmandu. Day 1: Kathmandu (1350m)., Arrival in Kathmandu(Tribhuwan International Airport) and transfer to you at Hotel by our office representative. Day 2: Sightseeing Tour. After having breakfast in Kathmandu, you are being prepared for joining a guided tour of the amazing sightseeing Durbar Square, Swayambhunath - Monkey Temple and the famous Hindu temple - Pashupatinath. Day 3: Kathmandu to Gorkha (1060m). Drive approximately 5 hours to reach Gorkha. In the afternoon sightseeing around Gorkha bazaar (Gorkha is the birthplace of King Prithvi Narayan Shah- the Great, the founder of modern Nepal. Day 4: Gorkha to Khanchok (956m). The trail separates from here northeast toward Budhi Gandaki River. We follow the right trail toward Khanchowk bazaar for the night halt. Khanchowk commands good view of Gorkha himal. Day 5: Khanchok to Arughat (530 m). Continue on to Arukot. The trek today involved little bit of up and little bit of down toward Budhi Gandaki. Arughat is the largest village of this river basin. Day 6: Arughat to Seti Khola (Khola means river), (750m). Follow the river Budhi Gandaki toward its point of origin. We pass the village of Morder and Simre to reach Arkhat River.After Arkhat we ascend slowly toward Kyoropani. Day 7: Seti Khola to Machha Khola (890m). The trail descends slowly until you climb again to mountain ridge to Almara. Pass the forest trail to arrive at Riden Gaon. Day 8: Machha Khola to Jagat (1350m). Cross Machha River and head upstream along the river's edge. After crossing Khola besi, there is a hot spring called "Tatopani". The trail follows forested area after this toward Doban. Below Doban. Day 9: Jagat to Deng (1960).Ascend a rocky ridge up to Salleri then to Setibas. 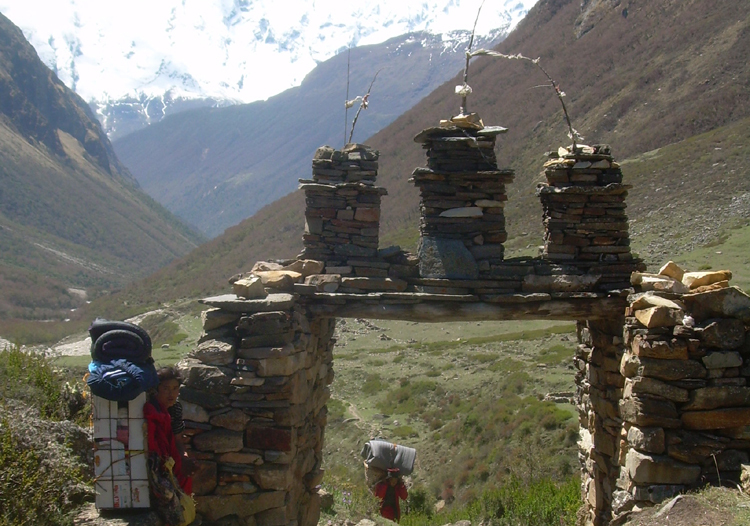 The trail follows the best and new route to Manaslu via Ngyak. Then the trail goes ahead to Ganesh Himal Base Camp. Later on, the trail reaches to Serson. Day 10: Deng to Ghap (2380m). Cross Budhi Gandaki again and climb up, pass a waterfall, cross a stream, and continue to climb ahead to Shringi Khola; cross it and reach Ghap (Tsak). Day 11: Ghap to Namrung (approximately 2700m). The trail crosses over Budhi Gandaki enters woods then it climbs up to Budhi Gandaki valley. The trek climbs over a big rock, continues up through deep fir and rhododendron forest, and then enters Namrung. Day 12: Namrung to Sama Gompa(3360m). The trail follows to Nupri region; the trail passes Barcham and crosses Hinan Khola and reaches to Sho. The trail then follows to Lho and drops down across Damonan Khola. Day 13: Sama Gompa - Samdo (3780m). Descend to Budhi Gandaki and to Manaslu Base Camp. The Larkya La trail passes several Mani walls and reaches Kermo Kharka. The trail then climbs steeply to find Samdo nestled behind a ridge. Day 14: Samdo - Larkya Rest House Go further on to Larkya La. The trail forwards and climbs in and out of the gorge and reaches the only shelter on the route to the pass, Larkya Rest House. Day 15: Larkya Rest House Larkya La - Bimtang Start earlier. The trail reaches at the top of the moraine at 4700m. And climbs steeply to the pass at 5135M. Then the trail descends to Bimtang (" Plain of Sand" in Tibetan Language). Day 16: Bimtang BagarChhap (1992m). The trek descends to Dudh Khola and reaches Gho crossing Pine and Rhododendron forests. At the foot of the valley, part of Lamjung Peak above the Marsyangdi valley comes into sight. Day 17: BagarChhap - Chame (2630m). Today you will negotiate a few steep forested ridges, along with several landslides on route, remember to look up though, as you will receive some sensational views of major Himalayan peaks. Day 18: Dharapani to Chame (2630M). Today you will negotiate a few steps often rough and rocky-forested ridges, along with several landslides on route, remember to look up though, as you will receive some sensational views of major Himalayan peaks. Day 19: Chame to Pisang (3190m). A narrow steep path through a very dense forest will bring you to the dramatic curved rock face, rising 1500m from the river. As the trail opens up you will be surrounded by Himalayan Peaks all the way to Pisang, at 3190m. Day 20: Pisang to Manang (3570M). Enter the upper Manang region, where the rainfall has much lower effect of the monsoon by the Annapurna range. You will notice more contrast with the landscape and vegetation; the cold barren climate creates a much harsher environment. Day 21-24: Cross Tilicho Pass to Jomsom from Manang one heads out through the western gates and then one follows the path down to the river. Cross it and continue on the south side of it through coniferous forest towards Khangsar. Cross Mesokanto La. Day 25 Jomsom To Pokhara:25 Minutes by Flight, After the breakfast, your trekking crews will help you carry your duffel bags to the airport and offer farewell for the last time. Our representative in Jomsom will make all the arrangements for your flight from Jomsom to Pokhara. Transfer to your hotel in Pokhara lake side. Onward times free for you. Day 26 Pokhara To Kathmandu::6 hours drive by private by bus, Early morning drive to Kathmandu. Transfer to your hotel; the day at leisure to rest, perhaps catch up on some last minute shopping or explore any sights you missed during your first day in Kathmandu and evening celebration dinner together. Stay overnight in Kathmandu.